The PocketBook Ultra is one of the new ebook readers that PocketBook unveiled last week, and it just turned up for a first look in a YouTube video review, which is a little surprising seeing as how it’s not supposed to be released in Russia until the end of June. 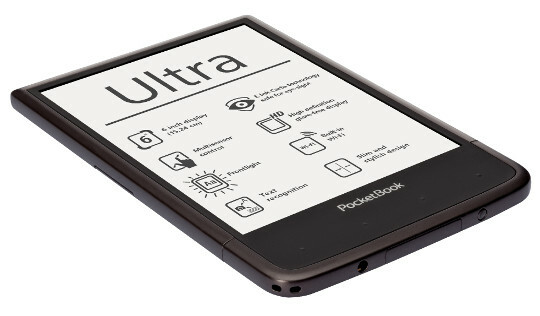 The PocketBook Ultra is a 6-inch ebook reader with a high resolution 1024 x 758 E Ink Carta display, the latest screen from E Ink. It has a frontlight, a capacitive touchscreen, a microSD card slot, it supports audio, and even has a 5MP rear camera, which can be used for taking pictures, reading bar and QR codes, and converting text in images into editable text. The first thing that jumps about the PocketBook Ultra in the video below is just how phone-like it appears with the narrow side bezels and compact design. That’s the same thing I said about the Samsung Galaxy Tab 4, so it must be a trend. The video also gives a glance at PocketBook’s new-look software. They just recently unveiled a new user interface with a new homescreen, menus, and library view, among other changes. One thing the video didn’t show is the back of the device. There you will find the camera with LED flash, as well as page turn buttons on each side. You can see the person using the buttons toward the end of the video, but they aren’t shown. The PocketBook Ultra is the first ebook reader to have buttons on the back like that, not to mention the camera.